We produce all kinds of NdFeB magnets with different shape : Block, Ring, Disc and Segment. Producing any sizes according to Customers' drawing, with wide choice of surface coat : Phosphate, Passivation, Zn, NiCuNi, Epoxy, Gloden, Silver, Everlube, IVD and Chemical coat etc..Sintered NdFeB permanent magnet materials with excellent magnetic properties, widely used in electronics, electrical machinery, medical equipment, toys, packaging, hardware, machinery, aerospace and other fields. 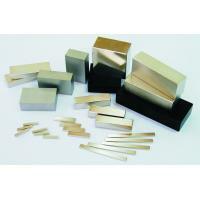 Produce wide grade of sintered NdFeB magnet, could reach highest grade as N52, N48H, N45SH, N42UH, N38EH and N35AH.